Maui has plenty of great Luaus, but if you want the real deal – to see a Luau at its most authentic – there’s really only one place that does the trick. 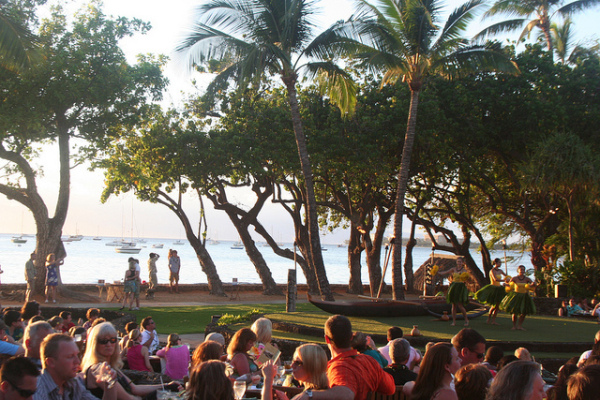 The Old Lahaina Luau is one of the few that’s not actually hosted by a resort. And it’s hands down one of the best on the island. Set in an intimate venue in front of the ocean in downtown Lahaina, it’s not too crowded, has excellent food, an open bar, and great hula dancing. The staff here has the Luau experience down to a science, handing you a mai tai as you walk in, just before guiding you to your table. They have a great buffet, and even if you prefer table service you won’t be disappointed. Everything is cooked fresh in the traditional fashion. This is the best place to come if you want a taste of how Native Hawaiian food was before the influence of American, Portuguese, and Asian cuisine. Indulge in the classic kalua pork, slow-roasted as a whole pig in the traditional underground “imu” oven. And then there’s Pork, which is wrapped in taro leaves and cooked until it’s as soft as butter. Don’t forget to dip it in poi, or taro root paste. It’s an acquired taste, but definitely worth a try if you want to do it right. You’ve also got to sample their ultra-tender pineapple marinated chicken. For dessert, they have a ridiculous chocolate brownie topped with rich macadamia nuts. 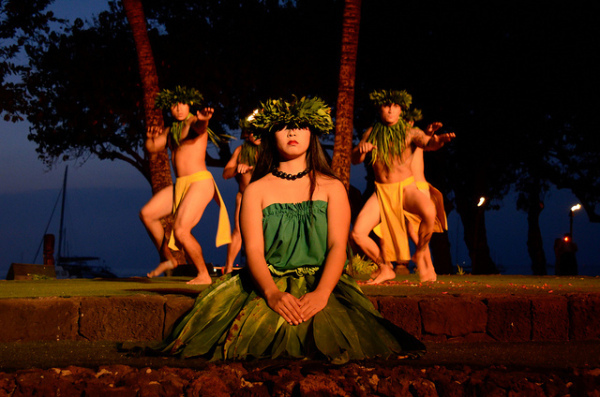 Hula dancing and the story it tells about Hawaiian history are the stars of the Old Lahaina Luau. Since this is an authentic Hawaiian Luau, you won’t find fire twirling and knife dancing, as these performances originate in Polynesia and Samoa. This Luau is committed to authenticity, only choosing acts that are integral to Native Hawaiian culture. But don’t get me wrong, the dancing here is excellent! Besides the show itself, there are plenty of side activities. They have a workshop where you can make your own flower lei. You can also watch wood carving and basket weaving demonstrations. 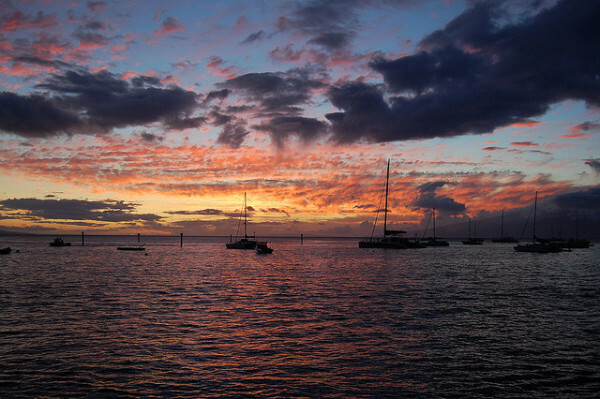 The Old Lahaina Luau is located in downtown Lahaina right along the ocean, facing the setting sun. You can walk the path that runs along the water, which is a great place for a family photo and a nice warm up before the festivities begin. Seating is amphitheater style, so everyone has an unobstructed view of the stage. The best part too, is that the experience is akin to dinner theater where you can watch the show as you eat at the table. If you want to take the authenticity to the next level, I’d suggest booking something in the first row. These tables are set up with traditional pillow seating. Because this Luau is in such high demand, tickets aren’t cheap and tend to sell out quickly. It’s $105 for adults and $75 for kids 2-12 (infants 0-2 get in free). Just remember that your ticket price does include unlimited cocktails at their open bar. Imagine bottomless mai tais, and piña coladas. The audience at the Old Lahaina Luau tends to be more adults than young kids, but the whole experience is still definitely kid-friendly. 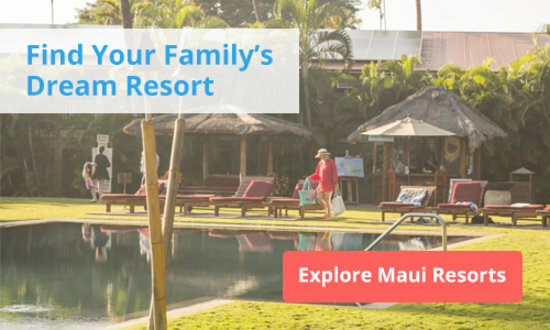 Keep this in mind as you start looking for the Maui Luau that best suits you and your family. You can always explore our complete Luau guide to see what else Maui has to offer. 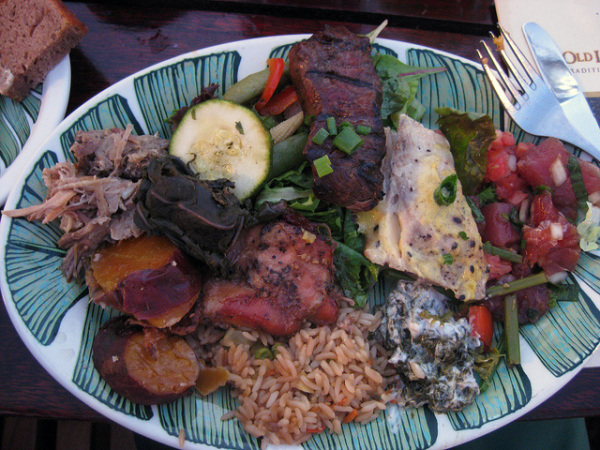 Dine on pork cooked in an underground oven, while the sun sets over the ocean to traditional Hawaiian music and dance. It's an intimate venue great for families.